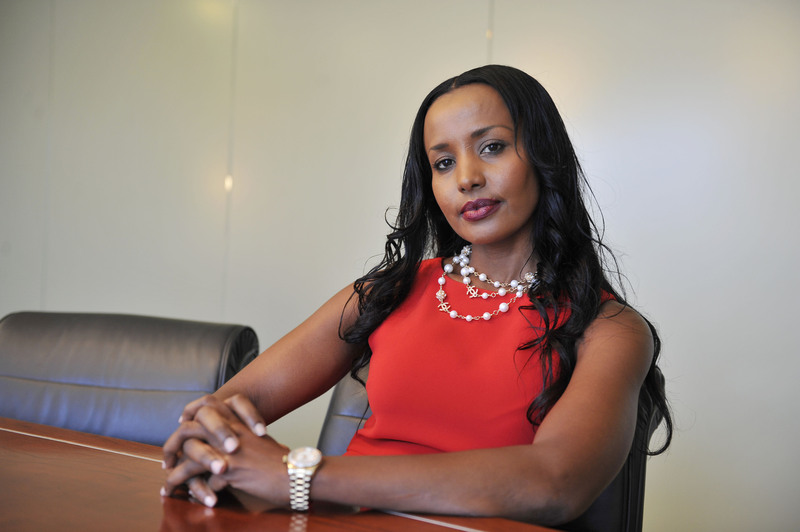 Nothing ever came easy for financial expert, Dega Nalayeh, but the Somalia native, who grew up in a family of 12 children, has made her transition into the billion dollar financial industry look as smooth as her beautiful skin coat. 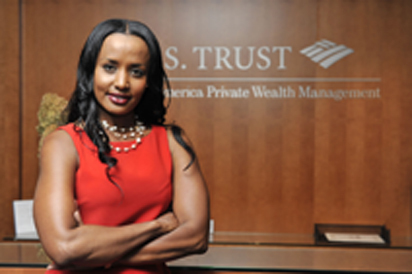 Nalayeh migrated to Canada before arriving in the United States and her ability to learn quickly and move rapidly has been key in her escalation into the hierarchy of U.S. Trust where she continued to grow professionally in a male dominated industry. 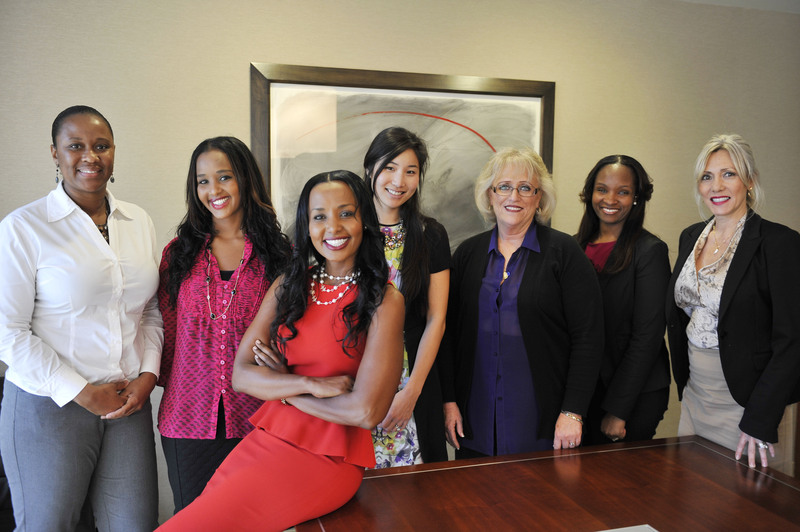 “Dega is a motivating person,” said Miesha Carter, client sales and service officer, of her boss Nalayeh, who is a senior vice president private client advisor with U.S. Trust, a division of Bank of America. 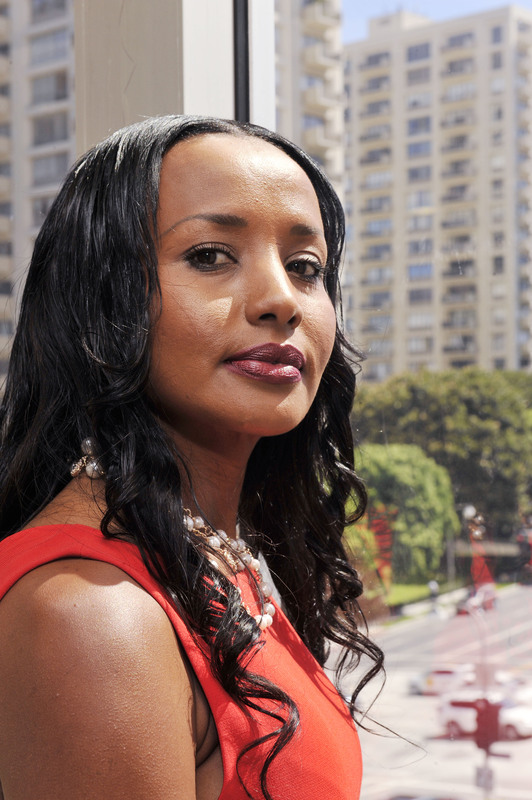 Nalayeh began her career with Bank of America over 15 years ago, where she started in the Consumer Bank and quickly assumed higher responsibility. She joined Bank of America’s Private Bank in 2006. Currently, she oversees more than $2.5 billion of client assets. “I deal primarily with individuals and wealthy families (minimum $3 million in liquid assets),” explained Nalayeh during a recent interview with the Sentinel. Nalayeh was born the fifth of twelve children in Somalia, where her father had been a politician. He defected in the early 80s, she said, and sought political asylum in Canada. “It was my father defecting from Somalia, which was home and finding out on the news, just like everyone else,” she recalled. She credits her success with clientele to being part of a large family. “My 7 sisters and four brothers and I all grew up in the same household. I think that really makes me good at what I do,” Nalayeh said. “It’s not just knowing the product, knowing the numbers… it’s about knowing human beings. A lot of what I do is like being a therapist, especially when you’re dealing with multi-generations of family and advising them on how to pass down wealth. There’s a lot of complexity when it comes to family. Nalayeh and one of her sisters left Canada for Atlanta where she began her career. They left Atlanta after two years for California. She’s been in her current position for a little over seven years now and it’s been hard work, she said. “I started with no clients,” she explained. “Luckily, I can say seven and a half years later, I manage over 2 billion dollars in assets. And, that’s really just going out there, going out in the community and just asking for business. “It’s not easy. No one is just going to give you 3 million dollars and say, ‘hey, Dega, I see your title, here’s 3 million dollars for you to manage.’ I think it’s credibility and having your existing clients. The majority of my business comes from referrals from my existing clients… one thing that makes me unique is the passion that I have. That’s why she sets up customized classes for her client’s kids. “They could be a teenager, they could be 40,” she said. She begins with a test to see where they are financially. From there, she teaches them everything from the basics of banking to lending and investing. As busy as her work schedule is, Nalayeh, a single mom, must also find time for her six-year old son and a variety of volunteer efforts, one of which is speaking to women about financial literacy. “One thing I advise is that women need to take control of their finances,” she said. “Throughout the years I’ve seen a lot of women hand over their finances to the significant other in their lives. What I do is more educational… how do we understand our own finances. She also volunteers at schools, teaching kids financial basics. “I think that children are so impressionable,” she said. Being healthy and finding balance is how she keeps it all together, she said. Eating well and staying active just makes for a better life. “You manage better,” she said. Part of her health routine is doing marathon runs for different charities. “Running for me, is peaceful and I have a passion for charity, so why not combine the two,” she said. “She’s a go-getter and she doesn’t back down,” said Taire Hanson, a client services manager who has worked directly with Nalayeh for the past six years. Nalayeh works with high end clients but says anyone can apply her financial advice to their lives. “I think it’s really important to understand the big picture. I don’t care if you’re making ten dollars or sixty dollars. Start saving. Be on a budget,” she said. Nalayeh received her Bachelor’s Degree with Honors from York University in Toronto, Canada, where she majored in Applied Mathematics and Physics.